Greyborn Rising will be released late April just in time for Derry’s appearance at the Bocas Lit Fest. Formed by a group of enslaved men during Trinidad’s British colonial occupation, The Order has maintained the delicate balance between the world’s realms-the Absolute, the Grey, and the Ether-for centuries, preventing the Greyborn, the Grey’s supernatural occupants, from hunting in the Absolute and ensuring that the human occupants of the Absolute remain unaware of the Grey’s existence. But not everyone believes these worlds should be separate. Some long for the days when fear ruled the earth and they plot towards flooding the earth with an uprising of Greyborn. The Order finds itself embattled by enemies outside and traitors within who conspire to unite the Absolute and the Grey. With the very essence of human existence under attack, Rohan, the last surviving member of the Stone Chapter of The Order, must act. 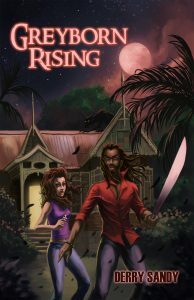 Assisted by Katharine, a soucouyant who has lived on the outskirts of a Trinidad swamp for more than a century, Rohan takes up the Order’s mantle, combining Kat’s wits and his fighting prowess to defeat the forces working to bring dangerous creatures across into the Absolute. They are joined by an eclectic group of recruits who risk torture, dismemberment, zombification, and death as they face a growing variety of grave threats and gruesome creatures. Trinidadian born Derry Sandy is a corporate lawyer barred in New York and living in Washington DC. He is new to creative writing—his previous writing credentials include articles for the Howard University Hilltop and legal briefs, articles and analyses written at his firm and at New York University School of Law where he received his J.D. Greyborn Rising is his first novel, but there is no doubt, this is what he is meant to do.